Precision tubes for the automotive industry must meet the highest performance requirements. MAC’s® Eddy Current, Flux Leakage and Ultrasonic systems are often used to inspect tubes destined to be cut into short lengths to be fabricated into a critical automotive component. MAC’s innovative solutions can operate right on the production line or in an off-line setting to identify defects of critical automotive components. Some examples of automotive components are shock absorber tubes, strut tubes, propeller shafts, fuel injection lines, brake lines, etc. 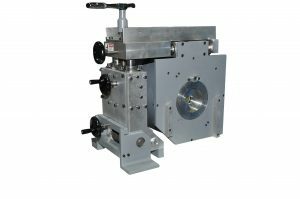 These end use applications can be quite demanding and may require multiple test methods to be applied to the tubes to insure that they can meet the quality requirements of the end use. Flaws that can be detected include weld defects, internal and external cracks, slivers, incomplete welds, penetrators and weld porosity. As an example, MAC’s Longitudinal Rotoflux® system can inspect electric resistance welding (ERW), normalized, cold-worked and straightened carbon steel tubes used for automotive suspension structures and cross members with geometrical variances in the wall thickness. 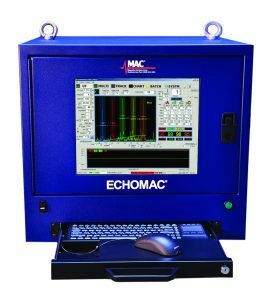 MAC experts can recommend the proper test method, or combination of methods, based upon the capabilities and limitations of a specific NDT technology. Other factors include the metallurgical character of the product, diameter, wall thickness, tube condition, and throughput speed of the product under test. The point at which the test is applied in the manufacturing cycle also influences the choice of method and apparatus. 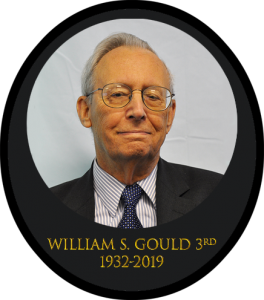 Generally, Eddy Current is the preferred method to detect small, short, incomplete welds, and some subsurface cracks in carbon steel or non-ferrous tube that require high throughput speeds. Eddy Current method can detect most detrimental inside diameter surface defects in thin wall tubes. Ultrasonic test systems are recommended for full body tests, including the detection of long, continuous defects such as incomplete seam welds in tube, and inclusions, voids or cavities. Flux leakage systems are also available to accurately detect longitudinal and transverse surface defects on the OD and ID of heavy-wall ferritic or martensitic tubing. Operates with encircling, sector, or rotary test sensors. Up to eight test channels, null or absolute, can be used in any combination. 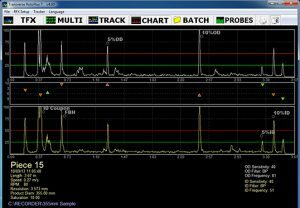 Detect short surface and some subsurface defects in tube, bar, and wire. Inspect welded tube for short ID or OD defects in the weld zone. Versatile Ultrasonic tester with superior performance and versatile, intuitive operation. For full inspection of tubes, pipes and bars, plate and weld. Use with rotary, spin-the-tube, squirter and bubbler installations. The Best Technology to Detect ID/OD Defects in Heavy Wall Magnetic Tubular Products. Detect longitudinal and transverse defects in heavy wall carbon steel to comply with required standards for OCTG pipe. Offers 24 separate channels for longitudinal (LRFX) and 48 channels for transverse (TRFX) defect detection. 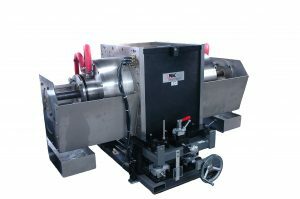 Using both rotary types together ensures detection of longitudinally or transversely oriented discontinuities such as seams, cracks, holes, pits, scabs, slivers, laps, roll-ins, and weldline defects. Differentiates between OD and ID defects. 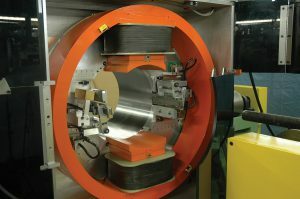 MAC’s® Eddy Current Testing (ECT) systems incorporate computer-based test instruments and test coils that use two ECT coil technologies: encircling and sector coils, and spinning or rotary probe coils. has been excited by an alternating current. case of a sector coil, in the area under the coil. current pattern, which the instrument detects. High-speed Ultrasonic (UT) Systems enable a full volumetric examination of materials and are designed to detect surface, subsurface, internal and dimensional flaws. This type of testing utilizes high-frequency sound waves that are transmitted throughout the material being tested in order to conduct a thorough inspection. Ultrasonic inspection can be used to detect surface flaws, such as cracks, seams, and internal flaws such as voids or inclusions of foreign material. It’s also used to measure wall thickness in tubes and diameters of bars. An ultrasonic wave is a mechanical vibration or pressure wave similar to audible sound, but with a much higher vibration frequency. For NDT purposes, the range is usually from 1MHz to 30MHz or higher. Depending on the test requirements, these waves can be highly directional and focused on a small spot or thin line, or limited to a very short duration. Two methods of UT are used for flaw detection – Shear and Compression Wave. 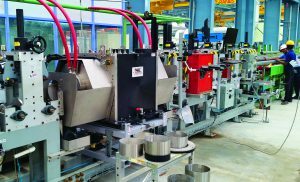 Magnetic Flux Leakage (MFL) nondestructive test systems accurately detect defects in heavy-wall magnetic tubing, including oil country tubular goods (OCTG). These electromagnetic test methods are also used to inspect high-permeability ferromagnetic metals such as carbon steel bar, plate, wire rope and parts. The method can also be used to detect ferritic inclusions in non-ferritic material. MFL inspection uses a DC magnetizing field to create enough flux density to bring the material to near-saturation. A transverse magnetizing field is used to detect longitudinally oriented defects, while a longitudinal field is used to find transverse defects. Surface or internal conditions such as cracks, pits, seams and other defects interrupt the flux field and “leak” beyond the product surface.